Your hamster can't talk, but if you spend time with your tiny friend, you will learn her needs and routine. With regular handling, you will recognize what is normal for her and notice when she isn't feeling well. Weight loss, matted fur, lethargy and diarrhea are common signs that your pet is ill and may need a veterinarian's care. Early intervention is key to your hamster's recovery. A healthy hamster will nibble continuously, so if your hamster's bowl remains full or she suddenly ignores her favorite treats, her disinterest in food may be a first sign of illness. Remember that hamsters hoard food in their cheeks and sometimes store treats in their nest, so it can be hard to track how much your pet is actually eating. However, if you notice your hamster has lost weight and her hip or shoulder bones are more prominent, she may have pneumonia or another serious illness. If your hamster has a runny nose, she may have caught your cold and should see a vet immediately. Human germs can pass to hamsters, so avoid your pet when you are sick. Keep her environment warm––from 65 to 80 degrees Fahrenheit––so she doesn't catch a chill. Be aware that an environment that is too dry can also lead to respiratory problems. Changes in your hamster's bathroom habits also can indicate health problems. Diarrhea and matted fur around her back end may mean she has a common disease called wet tail. If you suspect your pet has wet tail, contact your vet: this deadly disease can kill within a week, according to the Michigan Humane Society. Wetness near the tail is not always a grave concern. 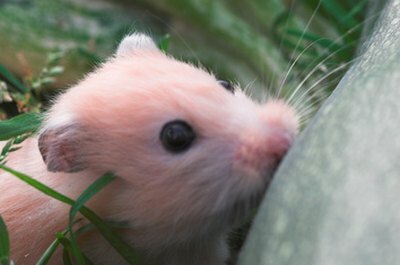 Ovulating female hamsters experience a normal bloody discharge and a healthy hamster gorging on greens can suffer from temporary diarrhea. Hold your small pal when your play with her to become familiar with her healthy body structure. Massage her body. If you feel a change such as a lump, she may have a tumor. If you see her limping, she may have fractured a bone. Consult your vet about the appropriate treatment. Sometimes your hamster's coat can tell you if she is unhealthy. A hamster's coat will change naturally with age and over time your fluffy friend may lose some of her fur. However, if you notice significant hair loss (alopecia), consult your vet. Thinning fur or patchy hair loss can also be a sign of health problems such as lice, mange or infection. Your hamster has a hoarding instinct but no common sense. She can injure her pouches unintentionally by storing inappropriate food or objects in them. If you notice that your pal's cheeks look unnaturally puffy or consistently full, they may be impacted. Mouth tumors or dental problems may also cause her cheeks to swell, so consult your vet if you see any change in her appearance.